The interest in the propagation of ultrasound waves in pipe-like solid waveguides arises out of several areas of the structural health monitoring (SHM) community for the detection, localization and assessment of defects as well as the prediction of remaining life in civil, mechanical, aeronautic and aerospace structures. SHM premise offers a continuous observation of the structural integrity of operational systems. This is particularly convenient, therefore, for the reduction of time and cost for maintenance without decreasing the level of safety. Some practical applications are the monitoring of pipework in gas and oil industries, suspension bridge cables, nuclear fuel cladding tubes, etc. This paper describes an approach for SHM using guided waves in pipe-like structures in terms of a pattern recognition problem. The formalism is based on a distributed piezoelectric sensor network for the detection of structural dynamic responses. Several methods for signal filtration, feature selection and extraction, and data compression of the recorded time histories are discussed and evaluated. Principal Component Analysis (PCA), Non-Linear PCA (NLPCA) and Wavelet Transform are among them. Additionally, the different clusters, corresponding to each damage level are visualized with the help of Self Organizing Maps (SOM). Tests were performed on a piping system where the properties of the proposed methods are compared and appraised with experimental pitch-catch signals between the pristine and the damaged structure. Buethe, I. [et al.]. 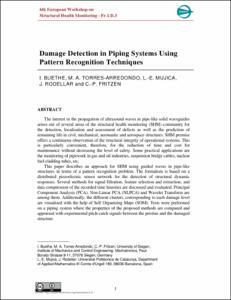 Damage detection in piping systems using pattern recognition techniques. A: European Workshop on Structural Health Monitoring. "Proceedings 6th European Workshop on Structural Health Monitoring & 1st European Conference On Prognostics and Health Management, July 3-6, 2012, Dresden, Germany". Dresden: 2013, p. 1-8.